Now did you know that Monkeys are the best creatures on the face of the Earth? Its true – as they are cute, they are strong, they are computer literate, and they are the stars of this film; one Directed by J. Lee Thompson; and Starring: Roddy McDowall and Ricardo Montalban. It was made in 1972 and lasts for 88 minutes. In an alternate Earth unlike our own, a rare disease has killed off all the world’s cats and dogs, leaving the human race to replace them with monkeys. However, over time, humankind came to realise that monkeys could be utilised to become more than just household pets – and they train them to perform domesticated tasks to suit their needs. Inadvertently, this innovation benefited the humans and suppressed the monkeys – thus making the world a fascist state. 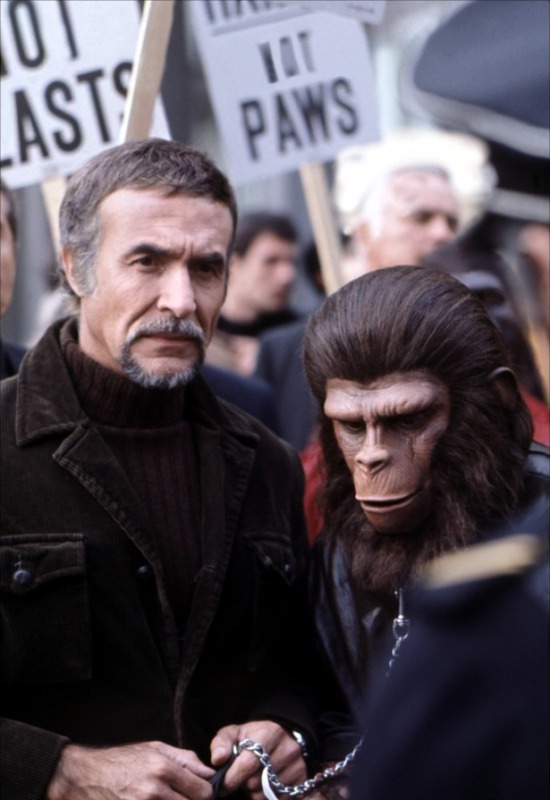 Still, what does any of this have to do with circus owner, Armando (Ricardo Montalban), and his favorite pet ape, Cornelius (Roddy McDowall)? Unfortunately – a lot! You see, Cornelius is the son of advanced apes’ from the future (as seen in ‘Escape from the Planet of The Apes ’), and for his whole life he has had to damped his intellect from the prying eyes of ‘those above’. And does he still manage to do this now? Err – no – not really – which causes a whole world of trouble for both himself and Armando. For Cornelius, he manages to find himself in a ‘Ape Management’ unit – where they recondition him – tag him – and then sell him to Governor Breck (Don Murray), where he is then allowed to give himself the name Caesar. As for Armando on the other hand, he is detained by governmental forces – whom quiz him about his monkey and a possible connection to the ‘apes from the future’ – leading him to then make a life changing decision of paramount importance. Now when the news of Armando’s fate reaches Caesars ear, he goes bananas - literally. He organises the apes – he uses them to subvert protocol – and he prepares to fight back in the only way that ‘humans’ can understand, revolution! Prudently, by this time, Breck and his men are all too aware of Caesars true-nature and what he is up to – and they find a way to subdue him. Nevertheless, with a little help from a human ally, MacDonald (Hari Rhodes), and an ape friend, Lisa (Natalie Trundy), Caesar escapes – resulting in a showdown that will change the face of the world forever. What then transpires if brutal, swift, and ape-like in nature – as humans fall – apes rise – and the fate of mankind is left up in the air. OK, so before I tell you my opinion on 'Conquest of the Planet of the Apes', I think it best that I boar you sh*tless with some ape-trivia first. (1) The battle sequences in this film was modelled after the 1965, Watts riots – which happened in Los Angeles over six days. (2) There were five original ‘Planet of The Apes ’ films – and this one was the forth installment, acting as a bridge between the past and the future. (3) Roddy McDowall starred in four of the five films – playing Cornelius in two and his own son Caesar in two too. (4) Natalie Trundy also starred in four of the five film – playing Lisa in two of them, a doctor in the third installment, and a mutant in the second. (5) The director of this film, J. Lee Thompson, also made the original 'Cape Fear'. (6) This movie was filmed in Central City, Los Angels, and resembled what the first film was supposed to look like – thankfully, they didn't have enough money at the time. (7) This film was meant to be set in 1991 – with the preliminary back-story in 1983. (8) This was the only ‘Apes’ film without a pre-title sequence – as it was cut from the final screening due to the violence it showed. Also, a lot of other sections of this film was cut from the final version – especially from the ending. And (9) The end sequence of this film was re-shot as it was deemed too bleak. Boy-oh-boy – I sure do know a lot of ape-facts, huh? Well, to be honest with you, I am a big fan of this film-franchise. Still, will my knowledge be a positive thing or a negative thing where my review is concerned? Hmm? Not really sure – as all I can say is that this isn’t the best film out of the bunch, and if anything, it does feel a little unripe to me. You see, the problem with ‘Conquest of the Planet of the Apes’, is that it tries to do too much, whist at the same time giving too little. In essence, this film attempts to do two thing – initially, connect two parts of an encompassing story together – and subsequently, introduce a new tone to this franchise as well, a brutal tone. However, due to a conflicting production edict, both of these factors did not really pay off cinematically, and on occasion can feel pretty flat and silly. 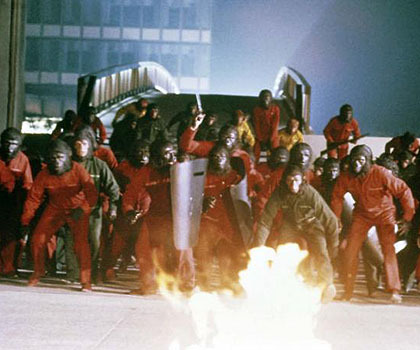 For example, the initial exposition scene where Roddy and Ricardo’s characters introduce the audience to this ‘new world’, by walking around the city and showing how the apes are being treated – well, it did look a bit weird in retrospect. The apes wore suits and the interaction mannered, thus making the whole premise feel kind of strained. Now this can be said for some of the action sequences also – as the tone and the pace of these scenes appeared strangely off kilter, suppressed even. To juxtapose this stance though, there were occasions that the suspenseful nature of this film was very compelling to watch - making it more of an adventure movie rather than an epic tale. Also, there is a message behind this film – relating to the equality of human rights – and if any movie that can spin a little morality tale into the mix, it’s a good movie in my book. 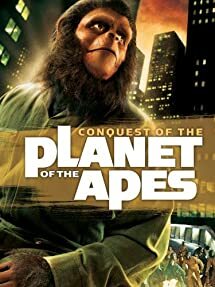 Overall, ‘Conquest of the Planet of the Apes’ is a fair film to watch if you like to follow this film franchise. It is politically minded – mannered in its approach – and the sentiment is very compelling to boot. So if you are a fan of the first film, or any other science slanted animal movies, you’d go ape over this one.